Create a collection of ornaments for your Christmas tree using this series of cutting files and card stock in coordinated colors. The series was loosely inspired by Polish Folk Art design and includes a snowflake, a bird and holiday tree. All use curled designed to give 3-D effects. This is the tutorial of the the Folk Art Snowflake. When finished it is about 6" high and can be flattened to store flat in the off- season. Parts sizes: - in inches - Sizes are when in orientation shown to right. Reinforcer ring - cut 2 - .5253" in dia. Special Note: I update the instructions online. Check here for adjustments and additional information. Don't just rely on the pdf file that comes with the download. 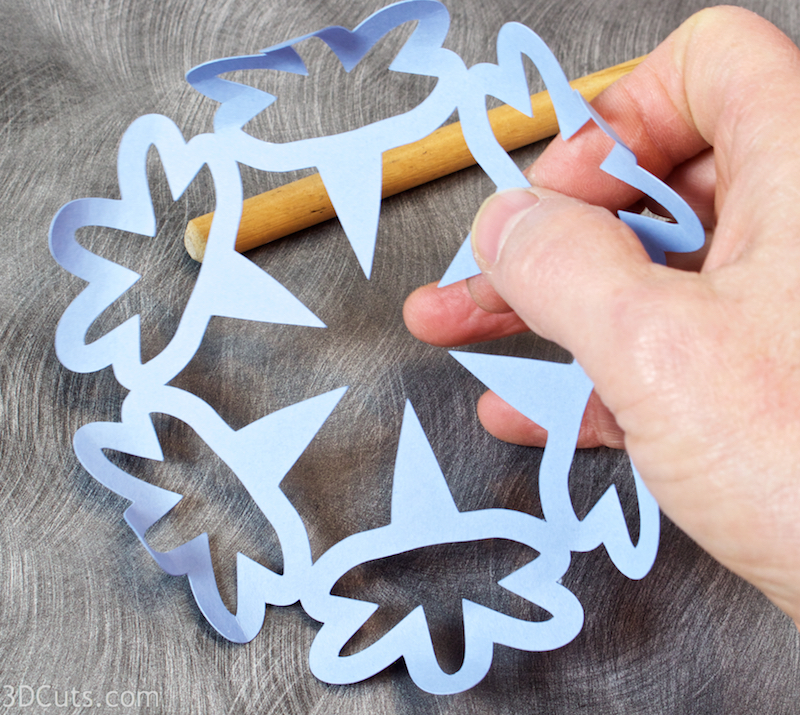 This file is located at Xhttp://3dcuts.com/ornament-folk-art-snowflake-tutorial. Pieces are cut fro 3 colors of card stock. I used blues for the tutorial but you can use any favorite combination. 6.GLue the reinforcing circles in place. I used a toothpick to apply a thin controlled amount. One gets glued to the front of the ribbon circle. The other gets glued to the back. Use a round implement from your craft stash to curl the tips of all the edges of one middle circle. I used a 3/8" wooden dowel. Curl all 6 edges of the medium blue layer. Notice a tiny notch on the edge of one of the middle layer petals. This is to go to the top of the ornament. This piece is not symmetrical and must be positioned the proper way. If you have the notch at the top the center will align nicely. If it doesn't flip it over, still keeping the notch at the top. 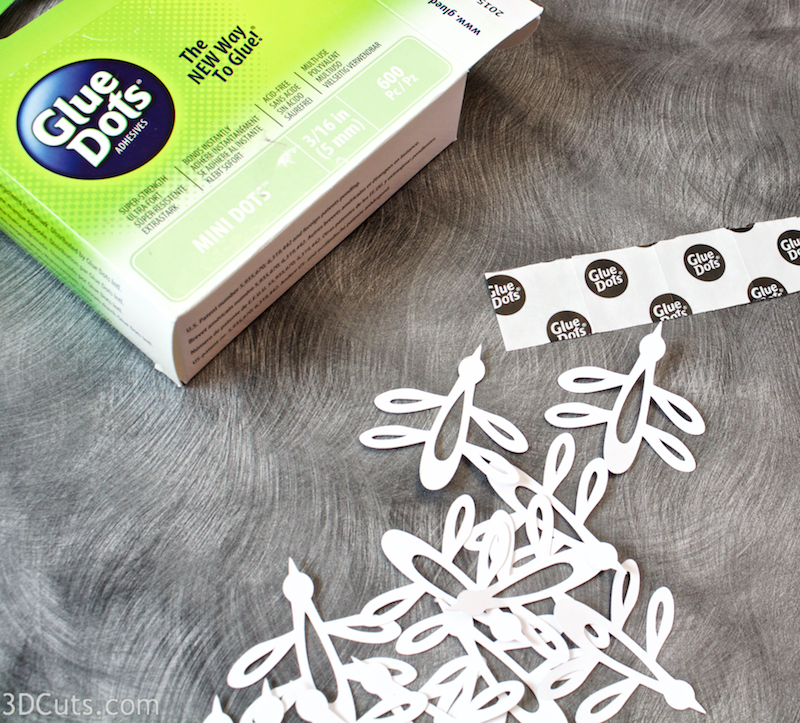 Make sure of the positioning before you add glue and be sure to add glue to the back side. The two middle pieces will be opposite of each other. Add a thin layer of adhesive to the 6 inner points of the middle layer. Don't add any to the petal area. Adhere this to the background piece paying attention to alignment in the center. Repeat this on the second side. Again - be sure of positioning using the tiny notch as a guide before curling the petals and applying glue. Adhere on the back side. Each of the white bug shaped pieces will be adhered. (Note, these aren't bugs but it is a great word to describe them!) I used mini glue dots for this step. I put one glue dot on the round "head area" of each bug. Use your fingers to bend the wings and tail forward to give this piece dimensions. Adhere it to one section of the snowflake matching the spacing in the point area. Repeat on all 12 portions of the snowflake- 6 on front and 6 on back. Attach at coordinated 1/8" satin ribbon to make a hangers. The Folk Art Snowflake Christmas Ornament is complete. How about trying the other coordinating ornaments including the bird and the snow flake, all by 3dcuts.com. Or how about trying a different color scheme?